Venus & Olay Sugarberry helps lock in skin's moisture for less dryness (over time vs. Venus Breeze). Olay Sugarberry Moisture Bars release skin conditioners, while 5 blades get Venus-close. Olay & Venus give you a pleasurable experience – a match made in skin heaven. Wrap your skin in comfort with Comfortglide Sugarberry with Olay. Women's razor with 5 curve-hugging blades for a Venus close shave. Flexible Olay moisture bars release lush body butters as you shave. No shave prep needed, just wet and shave. Sugarberry scent. 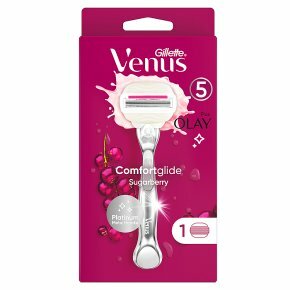 Any Venus blade fits any Venus razor handle, except Simply Venus.The Venus Comfortglide Sugarberry with Olay women?s razor will wrap your skin in comfort. Flexible moisture bars release light body butters, allowing the razor to glide seamlessly. The 5 blades give you a close shave, revealing smooth skin.